The GoPro Hero 7 recently hit shelves after months of anticipation. 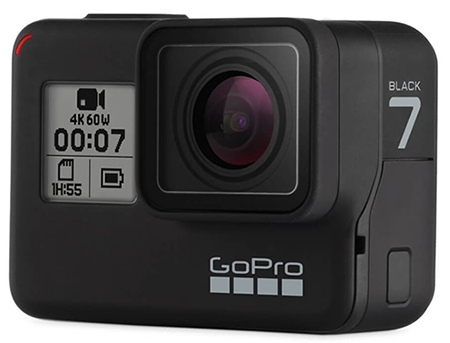 Consumers were eager to see which features they can anticipate using, with many hoping that the new GoPro could fix long-standing complaints about stability and battery life. While the new camera did address some major concerns and added a few fun features for users to take advantage of, it didn’t address every complaint. This leaves many wondering if the Hero 7 is worth picking up, or if they should stick with the older Hero 6. One big improvement over the Hero 6 is its stability upgrade, dubbed HyperSmooth. Shaky videos were something that users of the prior model had to accept, often losing hours of footage because of camera instability. Worse, others were forced to spend hundreds of dollars on stabilization accessories. While the Hero 5 and Hero 6 were equipped with electronic stabilization, this often altered the image or failed to work properly. Correcting this with the Hero 7 also means that the new SuperPhoto feature can capture stills perfectly, even when the subject is in motion. Additionally, the new live streaming feature makes it much easier to share your videos on social media. Prior to this model, you could live stream, but it was a tedious and time-consuming task. Now, all you need to do is enable the feature on your GoPro app and you are set. At the moment, streaming is limited to Facebook or platforms that use RTMP, such as YouTube, but the company is hoping to expand this in the near future. There are a host of other, more minor new features that GoPro users are sure to love. For example, the video timer feature can be set to record for 15 or 30 seconds, saving you valuable battery life and memory card space. The UI has also been refreshed and is now a lot more intuitive than before. The RAM has been increased to two GB, mostly to allow for these upgrades. Microphones have also been tweaked in the Hero 7, allowing for greater range and a more balanced background than in previous models. What isn’t new is the camera’s cost. While the specific amount may vary depending on the retailer, GoPro is selling the Hero 7 for $399, the same cost as the Hero 6. Basically, you can choose the newer, better model without increasing your budget. The housing is also the same, with the exception of a few primarily aesthetic details. Consequently, you can still use the same accessories with the Hero 7 as you did with the Hero 5 or Hero 6. With all the added features, there is no shortage of advantages to the GoPro Hero 7. Between the touchscreen and intuitive UI and the smooth video stabilization features, this model can do almost everything. Users can take advantage of the stabilization and live streaming to share picture-perfect stories to Facebook and Instagram. Vertical video capture is another compelling reason to pick up this camera. While you could technically capture video vertically with past models, it is now easily done with the touch of a button, rather than manoeuvring the camera itself. These new features have left many comparing the Hero 7 to modern smartphones. With older models, users needed to keep their smartphone handy for certain shots while using their GoPro for others. This can get cumbersome fast and makes it harder to splice together shots when editing your footage together. The Hero 7 aims to fix all of that, by including the same features you can find on most smartphones, like TimeWarp and real-time sharing to social media. Not only does this make the Hero 7 a suitable replacement for your smartphone’s camera, it serves to keep your smartphone safer. Those devices are not built for the same type of environment as action cameras. The camera’s price tag is another massive advantage. Priced exactly the same as the prior model and containing a ton of upgrades, buying the Hero 7 is an obvious move for those looking to upgrade their camera or buy something new. Being able to use the same accessories is also a great way to upgrade your equipment without additional cost. As with any piece of technology, there are a few drawbacks. One big one is that there has been no change to battery life. It isn’t as much as most users would like but has remained more or less the same as with the Hero 6, which means that all these additional features are not draining the battery even faster. Another drawback is the lack of any manual focus control. While this may suit many users just fine, others prefer to have control over the camera’s focus. Of course, you can always make adjustments when editing, but that can be time-consuming, especially if you are shooting videos for a hobby. Who Should Buy the GoPro Hero 7? The Hero 7 is perfect for those who love adventure and who want to capture every minute. These tiny cameras can be attached to just about anything, including helmets, bikes, and dashboards among many other things, thanks to the wide range of available accessories. Extreme sports enthusiasts, travellers, adventure-seekers, and anyone else who wants a smaller camera capable of capturing action sequences with ease and stability can benefit from all that the Hero 7 provides. Thanks to the extra features and the same price tag as the previous model, the GoPro Hero 7 is an obvious choice for anyone looking to buy a new action camera. These powerful devices are waterproof, can capture motion with ease, and now come with a host of features that make filming your ideal scene easy.